This summer, my wife pre-booked Lake Louise campground for the weekend with my family and my son’s friend. 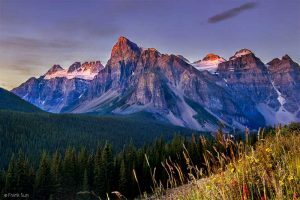 We planned to hike one day on the Iceline Trail(British Columbia, Canada, Yoho National Park) and another day do some biking near Lake Louise,etc. I drove my SUV left Calgary around 3:30pm on Friday and arrived at Lake Louise campground in 2 hours time. When everything got settled down, we had our BBQ dinner. Myself then drove along the Moraine Lake Rd and found a place to stop and photograph the glacier. The towering glacier was layed across on top of Bident Mountain, Mount Babel and Mount Fay.then pressed the shutter button on my camera numerous times but the pictures were not so impressive. So I decided to try again next morning to capture the sunrise.Next morning I got to the same place before twilight hoping to catch a glimpse of sunrise. I was very lucky, as in a matter of minutes, those peaks and glacier quickly lighted up with hues of pink, red and orange. So I grabbed my chance and captured this spectacular image. After that, I quickly drove back to the campground and had a quick hot breakfast to warm me up. Then we all packed ready heading to Yoho National Park to hike the Iceline trail. From the parking lot, we followed the path for roughly 8kms up hill with an elevation gain of 700m. The weather was perfect. Sunny and blue. We hiked about 2.5 hours uphill during which we saw colorful fire-weed, hoaring waterfalls and hanging glaciers. Then we reached where we admired the beautiful Emerald Glacier. 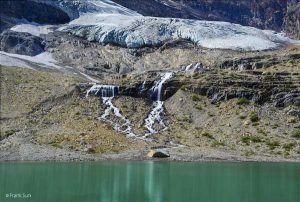 when we reached the glacier, there were a bunch of water falls and a peaceful pond, where we had our packed lunch.The mountain peaks and the glaciers were so enormous and majestic that it made the people standing below it look like little mice. The picture I took with my camera shows exactly that and gives us a reason to why we must try to prosper and preserve the beautiful environment that we live in so that future generations can observe and feel what we have witnessed. We wondered around taking photos and enjoying the breathtaking views so long around the summit area, we were among the last few people at trail going back. The next morning I decided to captured some sunrise on Bow Lake. I have been to the Bow Lake roughly four times this Summer. But this morning was the only time fortunate enough for me to witness the spectacular sunrise around the Bow Lake area. When I got there in the morning, it was still sort of twilight, roughly half hour before sunrise. 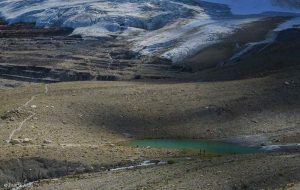 The moon was still hanging at the western sky above the Bow Glacier; While Mt Thompson on the right and Crowfoot Mountain and Crowfoot Glacier at left underneath. With time went by, the cloud gradually became more rosy. But then it started to fade away to a yellowish white color in a matter of minutes. I felt a little bit disappointed but still kept a positive thought and waited. a bit shy but ready to rise up above the morning sky. The scenery became even more astonishing as the lake had become standstill showing a full reflection of the beaming rosy light slowly rising over the majestic mountain peak. Wow, I was bestowed with such joy and my one chance of taking this beautiful photo. I quickly moved to another place and took a different angle shot of the Crowfoot Glacier and these fantastic photos made my trip harvested. Recently, Carrying photographic equipment to go hiking is not easy, I was in a car accident not long ago, the body is not yet fully recovered, so to go to many beautiful places are very difficult. Photos you want to take a good view must have a good physique. Adhere to exercise, such as swimming is an effective way to enhance physical fitness, I also often receive acupuncture and massage therapy. Acupuncture, massage therapy to reduce muscle tension, pain, recovery fatigue. Help in the future to go more places to shoot more and better scenery photos.